Yes, the listed price for the Fastenal # 44-5310A is for 1 ring terminal. 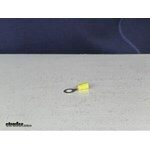 This is designed for use with 12-10 gauge wire and features a 3/16 inch stud. I have attached a short video review that you can check out as well. To clean threads I recommend using a nylon brush like # 814092. 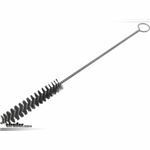 This will allow you to clean out any debris without causing any damage to the threads like a wire brush might cause. Sometimes there is paint or powdercoat in threads that may require you to use a thread tapper to clean them out entirely. You can pick this up at a local hardware store or create your own. Self tapping screws like the part # WLS100 which has a Torx head or a part # FA1131822 which is a hex head style bolt would work well. We don't normally see people seal the lights to the trailer as most light assemblies are a weather proof or waterproof design and don't require it. 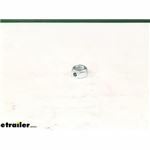 For a sealant we recommend the # 0160297 for sealing trailer roof vents. This would work well for a light assembly as well. We do offer a sealant that will work on fiberglass, but the part # 49329 that you referenced is not designed for it. 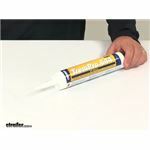 Instead I would recommend the TremPro 644 Silicone Sealant # 0160297 as it has been confirmed to work on fiberglass. To attach the aluminum diamond plate to the floor of your utility trailer, you can use self-tapping screws like # FA1131822 or something longer depending on how thick the aluminum is. I recommend using one about every square foot if possible. 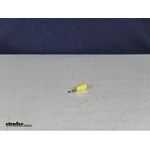 These particular self-tapping screws are 1-1/4 inches long and have 1/4 inch - 14 x 3/4 inch long threads. If you will be attaching the diamond plate to the metal grate on your trailer, you will need some type of anchor or lag bolts. 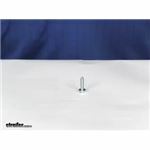 We offer two sizes of self-tapping button- (or washer-) head screws. 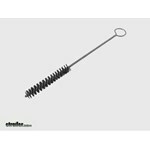 Part # FA1131822 has an unslotted hex head and is 1/4 -14 x 3/4-inch long threads. Part # 101131802 is # 8 x 1/2-inch long. Yes, for the black TremPro Sealant by Fastenal you would want the part # 0160299. The posts on the power distribution block of your 2014 Chevy Silverado 1500 are M6 like the part # 185916 and M8 like part # 185917. The M8 is for the 12 volt power supply and the m6 is for the brake controller power supply.